DR.MANFRED GERSTENFELD: THE AFTERMATH OF GUENTER GRASS’ HATE POEM……… – The Tundra Tabloids……. This article was published at YNET, and republished here with the author’s permission, and includes the footnotes left off by the YNET editorial staff. That German SDP political hacks (and other politicians) as well as some in the German domestic and in the international media have taken to whitewashing this jerk, is the more troubling aspect to the whole case. That Grass’s poem is anti-Semitic is not difficult to prove. One only has to place it next to the European Union’s definition of anti-Semitism to see that.3 Yet focusing on the hate poem’s content and on the many criticisms of it leaves a number of other substantial issues in the shadows. One of the main items of the public debate was whether Grass is an anti-Semite. This misses the point. In contemporary Western societies, mainly neo-Nazis and a substantial number of Muslims are full-time anti-Semites. The pre-dominant type of European anti-Semite is the part-time one. It is a typical expression of contemporary society in which structures, attitudes and opinions have fragmented and many personalities are split. Grass is a part-time anti-Semite. He demonizes Israel, yet claims in his poem that he’s a friend of Israel. However false that claim is, no full-time anti-Semite would take the trouble to say it. A few weeks earlier, Gabriel had accused Israel of apartheid policies. After much criticism leveled against him, he said that he only mentioned that it took place in Hebron.6 The SPD chairman has stated falsely that he is a friend of Israel. If this were true, he would have asked the German government to bring Iran before an International Court long ago due to its breach of the United Nations Genocide Convention, as Iranian leaders wish to eradicate Israel. Germany is a signatory of this convention and the Social Democrats were a partner in the coalition government until 2009. The Grass affair thus helps us unmask Gabriel as a hypocrite even further. Much can also be learned by looking at Israel’s reactions to Grass’s poem. Why did Prime Minister Netanyahu get involved with a poem, however ugly?7 Why did Foreign Minister Avigdor Liberman do so also?8 Why did Minister of Interior Eli Yishai declare Grass persona non grata?9 The poet had not announced any intention to visit Israel. Israel does not usually declare which ones of its many haters will be allowed entry. Grass thereupon compared Minister Yishai to former DDR Minister Erich Mielke, who was head of the Stasi Secret service.10 If Yishai had competent advisers, they could have told him in advance that a politician cannot win a shouting match with an author who can say the most absurd things. The Israeli travel ban also enabled other German politicians to criticize Israel without risking accusations of whitewashing the anti-Semitic poem. The Israeli government’s reactions illustrated once again the helplessness of the authorities in the propaganda war against the country. Not having analyzed it, nor having understood it, the authorities produce only ad hoc reactions to each new incident. Finally there is the question – why did five major European papers publish an anti-Semitic poem? One must mention that the Italian Repubblica did so, yet published critical articles next to it.11 The answer to this seems simple because the German Suddeutsche Zeitung, the Spanish El Pais,12 the British The Guardian and the Danish Politiken13are not contemporary mutations of the Nazi paper Der Stürmer. Like Grass, who is a part-time anti-Semitic poet, they are part-time anti-Semitic publications. 1 Bernard-Henri Lévy, “The First Death of Günter Grass,” The Huffington Post, 11 April 2012. 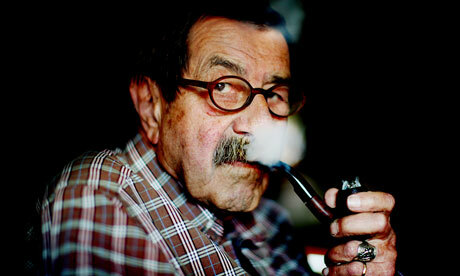 2 Günter Grass, “Günter Grass: ‘What Must be Said,’ The Guardian, 5 April 2012. 4 Reich-Ranicki spricht von “ekelhaftem Gedicht,” Welt Online, 7 April 2012. [German]. 5 “Gabriel verteidigt Grass gegen ‘hysterische’ Kritik,” Welt Online, 15 April, 2012 [German]. 6 Benjamin Weinthal, “German chancellor hopeful: Israel is ‘apartheid,’” The Jerusalem Post, 15 March 2012. 7 Shlomo Cesana and the Associate Press, “Netanyahu: Grass has no right to deny Israel’s right to defend itself,” Israel Hayom, 6 April, 2012. 8 Ofer Aderet, “Israeli politicians are having a field day over Gunter Grass,” HaAretz, 9 April 2012. 9 Lahav Harkov, Herb Keinon and Benjamin Weinthal, “Yishai declares Grass persona non-grata,” The Jerusalem Post, 8 April, 2012. 10 Siobhan Dowling, “Günter Grass says Israel ban reminds him of East German Stasi,” The Guardian, 12 April 2012. 11 Grass, Gunter. “Quello che deve essere detto” ; Volli, Ugo. Poem dedicated to Gunter Grass; Tarquini, Andrea. “Una poesia contro Israele, l’ultima provocazione di Grass : Le sue atomiche una minaccia” ; Prosperi, Adriano. “Se la storia viene capovolta in un brusio di responsabilità”. In La Repubblica, 04.04.12, 1,22,23. 12 Günter Grass, “Lo que hay que decir,” El Pais, 4 April 2012 [Spanish]. 13 “Dokumentation: Læs Günter Grass’ digt,” Politiken, 7 April 2012 [Danish]. Previous Post Previous Post TOP MUSTARD CLERIC AL-QARADAWI SAYS NO WOMAN CAN TRAVEL TO THE WEST UNCHAPERONED……. Next Post Next Post BIG UNION BOSS 1%:ER TRUMPKA AND HIS BIG BUCKS……..